NMR Spectroscopy, over the years, has emerged as one of the most robust spectroscopic techniques for a variety of applications. Developed by physicists, and embraced initially by the chemists and later by biochemists, NMR spectroscopy is now owned by the communities of scientists in all major disciplines, including biology, medicine, chemistry, and agriculture and geological sciences. 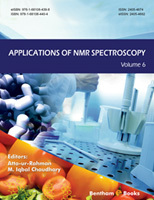 The 6th volume of the book series entitled, “Application of NMR Spectroscopy”, is an attempt to update readers on some of the most important developments in the use of NMR. spectroscopy The broad fields covered in these chapters include NMR-based metabolomics for medical diagnosis, cellular studies and industrial applications, NMR techniques for structure determination and dynamic studies on chemicals obtained from different sources. Allegretti et al. focussed their review on various NMR techniques used in the study of tautomerism. These NMR experiments can provide information about the causes of stabilization of different tautomeric forms, and help in predicting the reactivity, physical properties and biological behaviour of organic molecules. The authors have used examples of different classes of organic molecules, such as ketonitriles, ketoamides, salicylaldimines, etc., to demonstrate the power of NMR techniques in the study of rapid chemical equilibria. Chugh et al. discussed the applications of NMR spectroscopy in the field of metabolomics, which deals with the understanding of the metabolic profile of a biological system. The authors, through examples of diverse metabolomes, have presented merits and demerits of various NMR methods, combined with high-throughput separation techniques in metabolomic studies. The authors have also commented on recent developments in NMR, relevant to metabolomics based measurement and analysis. NMR spectroscopy has also emerged as a premier technique in medical diagnosis. Vaidyanathan has contributed an excellent review on the applications of NMR techniques in metabolomic based diagnosis of human diseases. Recent advances in NMR hardware, such as cryoprobe technology and high field magnets, have significantly enhanced the sensitivity of NMR experiments. NMR Spectroscopy now found wide application in the identification of biomarkers for various diseases such as cardiovascular and neurological diseases, metabolic disorders, cancer diagnosis and therapy, gastrointestinal disorders, etc. The study of relaxation mechanisms of nuclear spins in NMR spectroscopy can provide insight into molecular mobility and structural features. Tavares has reviewed the importance of two key relaxation mechanisms (spin-lattice relaxation, and spin-spin relaxation) in the study of small and macromolecules in food samples. These relaxation values can help in the study of molecular changes during cooking, food storages process and shelf life studies of oils and other constituents, including anti-oxidants. This review provides yet another exciting application of NMR spectroscopy in industrial process and quality control of products. Spence has contributed a comprehensive review on the molecular composition of soil biomass. Soil microorganisms are key indicators of environmental stresses, including climate change, land degradation, and agriculture footprint. Changes in the nature and chemistry of soil microorganisms, based on structural components, can be studied by using NMR spectroscopy. The author has provided examples of the use of NMR spectroscopy in the study of natural organic materials in microbial biogeochemistry using solid state NMR spectroscopy, isotopic enrichment techniques, etc. We are grateful to the authors for their excellent contributions. We are also grateful to the entire team of Bentham Science Publishers who have efficiently processed and timely managed the publication of this much awaited volume of the book series. The commitment and hard work of Ms Fariya Zulfiqar (Assistant Manager Publications) and Mr. Shehzad Naqvi (Senior Manager Publications), and the leadership of Mr. Mahmood Alam (Director Publications) are duly acknowledged. We sincerely hope that like the previous volumes of this useful book series, the current compilation will contribute to the better understanding of the applications of NMR spectroscopy.